In South Africa’s Kwa Zulu-Natal province, a dozen young men and women dressed in bright blue and yellow overalls are hacking down trees with machetes and chainsaws. But this is not deforestation run rampant. In fact, the workers are helping to protect biodiversity and save the country’s scarce water resources, by removing invasive plant species that are choking the countryside. With no natural competitors, non-natives like eucalyptus, Asian hydrilla and the highly toxic famine weed have spread rapidly, crowding out local species and destroying whole ecologies in the process. Alien plants clog fields and waterways, devastate crop yields, and exacerbate wildfires. They also consume far more water than local species, which is especially troubling for a country that in 2017 experienced the worst drought in a century. All told, the invaders cost the economy billions every year. But the Working for Water programme is tackling these weeds – whilst simultaneously fighting poverty and creating jobs for South Africa’s most vulnerable. 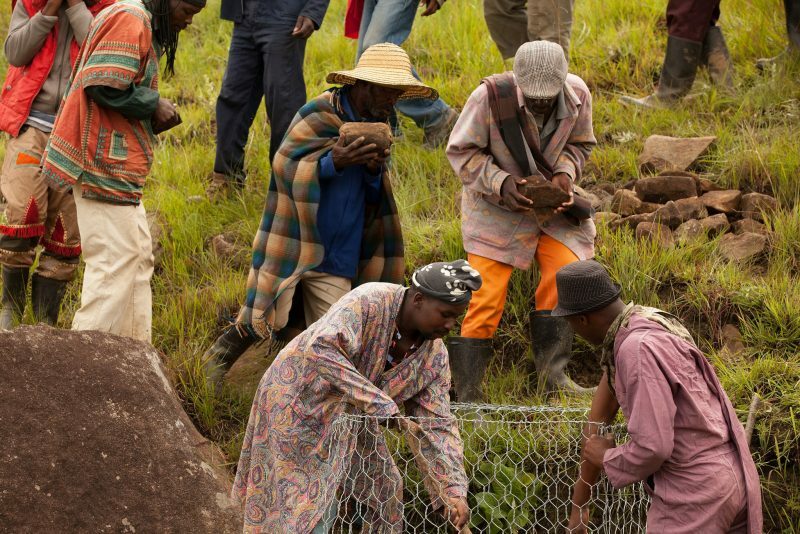 Established over twenty years ago by South Africa’s first post-apartheid government, the programme combines environmental protection and social welfare into “one ballsy programme”, as Kader Asmal, the former Minister responsible for the scheme, described it. "Conservation is a middle-class affair in most countries," he says, but Working for Water works with “the poorest of the poor" to clear the invasive weeds. "It’s recognized as a world leader in its field," says Asmal, referring to the scheme’s more than 100 international awards. Creating around 50,000 jobs every year, the scheme specifically targets the most disenfranchised: well over half its workers are underprivileged women, and the programme has ambitious quotas for young people, disabled individuals, and those living with HIV/AIDS. As well as jobs, Working for Water provides employees with education and training, health and reproductive care, rehabilitation for convicted criminals, childcare services, HIV/AIDS awareness courses, and savings programs. The project even helps local businesses, by providing free wood and biomass from the clearings to be turned into furniture, wooden toys, firewood, fuel chips – and even coffins. Dr Guy Preston, who has directed the project since its inception, explains: "Our Eco-Friendly Coffins pilot project gives the poor a chance to bury their dead with dignity, without paying extortionate prices." It’s true that the scheme has made missteps over its twenty-year history – a fact that Dr Preston acknowledges. But the scheme is undoubtedly having an impact. With over 3 million hectares of invasive plants cleared to date, the Working for Water model is now being applied to fire prevention, wetlands conservation, and reforesting. Taken together, these projects are showing that ecological restoration and rural development can go hand in hand.